On the Artwork Edit Screen you’ll find a region set aside for displaying twenty of any custom fields you’ve added to the artwork component to store additional text data. Any number of custom fields can be added to Tessera and an artwork can have additional information added to any number of custom fields. Tessera allows the display of twenty custom fields at a time. The twenty fields selected to be displayed can be altered at any time. Use this button to open Preferences onto the screen that allows you to create and review all custom fields. Use this button to display all entries for this artwork even if the entries are not one of the twenty chosen for display. 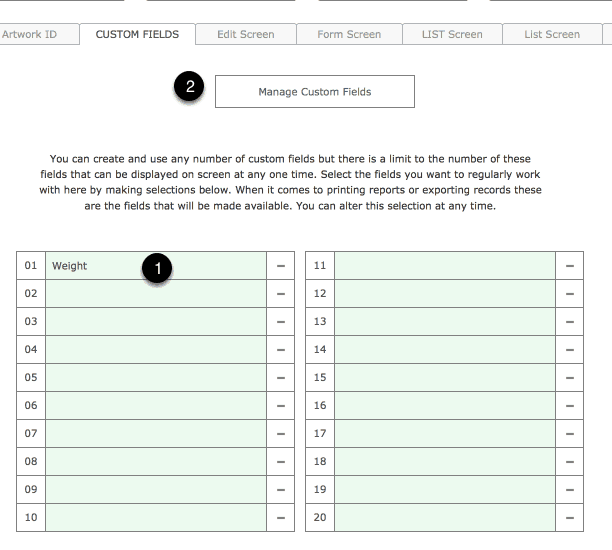 On the Custom Fields Preference Screen chose from the drop-down menus to select which of the custom fields you’ve already created are to be displayed throughout Tessera. This selection can be altered at any time. Altering these fields in no way deletes or alters entries in these fields. Use this button to add and edit custom fields.